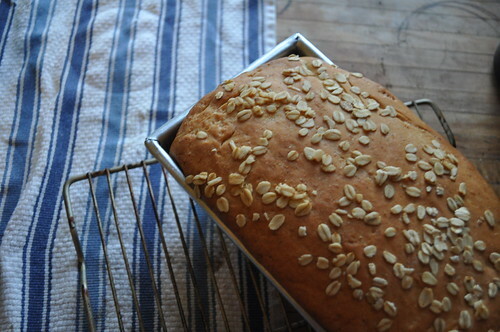 Inspired by my trip to Vermont over the weekend I made Maple Oatmeal Bread. It was pretty yum, better toasted. It’s just not what I imagined. I keep remembering this bread from my childhood from a bakery in North Conway, New Hampshire. The loaf I made tastes like it’s missing something. It needs to have more taste layers and be less dense? Does that make sense? I baked the loaves in two different types of pans. On the left I used King Arthur’s steel and aluminum loaf pan (picked up in VT) and on the right Emile Henry ‘s Ceramic Loaf pan. The rise was better in the King Arthur pan. Wonder why? (read answer in comments) I did everything the same way. 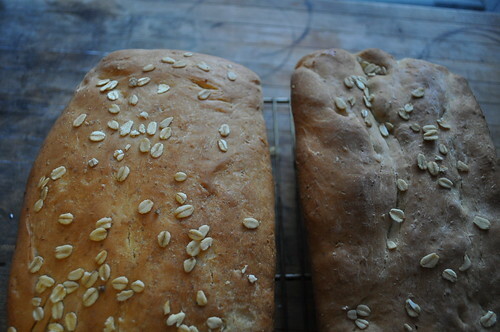 Let me know if you’ve come across a Oatmeal Bread recipe you love or have any bread tips. Recipe below. In a large bowl pour the boiling water over the oatmeal and set aside for an hour. Sprinkle the yeast over the cooled oatmeal and stir to mix. Add the maple syrup, salt, oil, and 3 cups of flour into the oatmeal. It will have the consistency of a heavy batter. Cover the bowl with plastic wrap and set aside to rise for an hour. Add additional flour, 1/2 cup at a time, to form a dough that can be lifted from the bowl and placed on surface or into a mixer with hook attachment. Knead by hand or using dough hook for 10 minutes. The dough should be clean the bowl in the final stages of kneading. Divide the dough into 2 pieces and shape it into loaves and place in greased loaf pans. Cover and let rise another 45 minutes. Preheat oven to 350 degrees at least 15 minutes. This is a fairly slow oven, so allow 40 – 50 minutes for the bead to bake to a light golden loaf. Remove the bread from the oven and turn the loaves from the pans. Place the loaves on a metal rack to cool before serving. I made this bread yesterday and it’s delish! I can really taste the maple. The only thing I did differently was add about 2 more cups of flour. It was way too sticky at the kneading stage! I’ve been making bread for years and it seems that in my experience if you want a lighter loaf (less dense) using an instant yeast helps. It definitely gives the loaves I make a beautifully light crumb. I’ve had great results with all of their recipes. This one is a particular favorite! I used bread flour. But the oats seemed lost in the end product. Oatmeal bread I’ve had seemed chewier. This recipe tasted more like funky white bread. I see your recipe calls for bread or AP flour. I’ve found that using bread flour, or even high-gluten flour if you can find it, makes for a lighter loaf because it lifts the heavy oats. The cinnamon swirl bread was better! Try that one first. Mmmm! This reminds me, I still want to make the cinnamon swirl bread you posted. I think your both right. My kitchen is really cold. I have a space heater running to heat things up. The ceramic pan is stored in a cabinet that’s pretty cold. I ran the pan under warm water for a few minutes before putting in the dough. I assume I didn’t warm it up enough. Thanks for the tips! 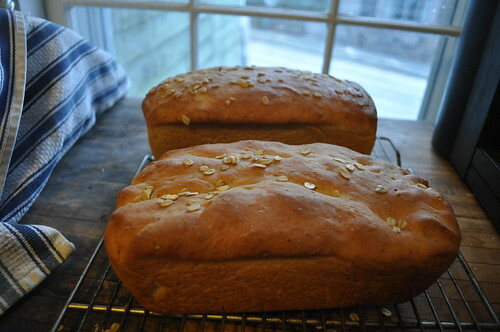 I’ve always had better luck baking bread in a metal loaf pan rather than glass or ceramic. I agree that it probably has to do with the fact that metal is a conductor (and therefore heats and cools faster)and glass/ceramic are insulators (and thus heat and cool slower). I find that my best loaf pan is an old one that I got from my mom that probably costs her less than $5! The bread not rising in the ceramic dish could have been the result of the dish being too cold. Where do you store your pans? Is it cooler in the storage area than it was where you were allowing the bread to rise? Because ceramic is so dense and thick as opposed to a thin metal baking pan, the metal pan will adjust to the warmer temperature more quickly than a ceramic dish; and warmer is better for rising! Remember how good was that bread was…I wonder if it is still there? Your bread looks really good. I can’t wait to taste some. Maybe we will have to take a road trip. Greg could climb, we could eat bread.